Y'all already know that Christmas is my absolute FAVORITE time of year! 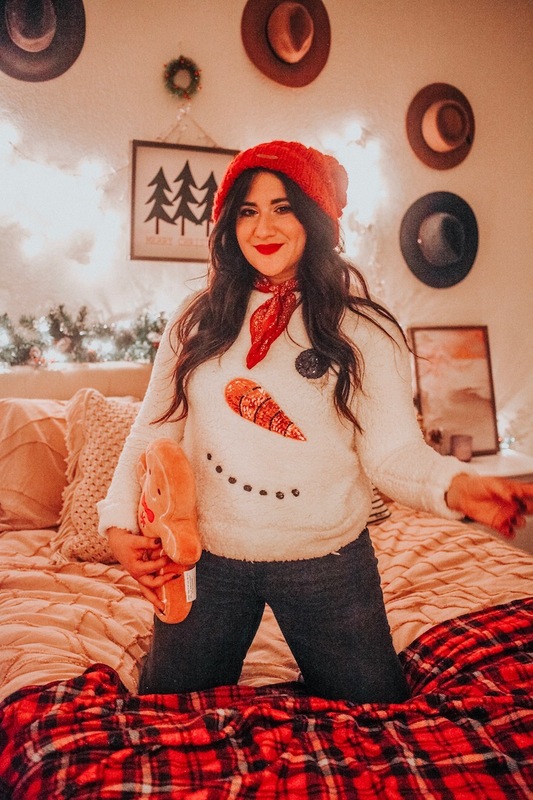 So when Stage asked me to join their virtual holiday party by sharing my holiday look and holiday decor tips, I was so excited. 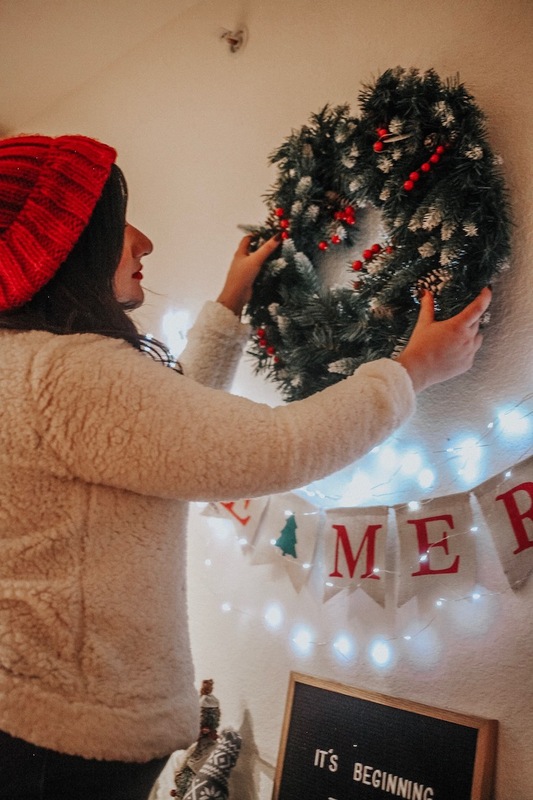 I had so much fun decorating my little space, throwing on Frank Sinatra Christmas getting cozy in this Stage fuzzy snowman sweater , and sipping on some hot chocolate, Theres something about twinkle lights , all the garland and Christmas trees that make my heart so happy. 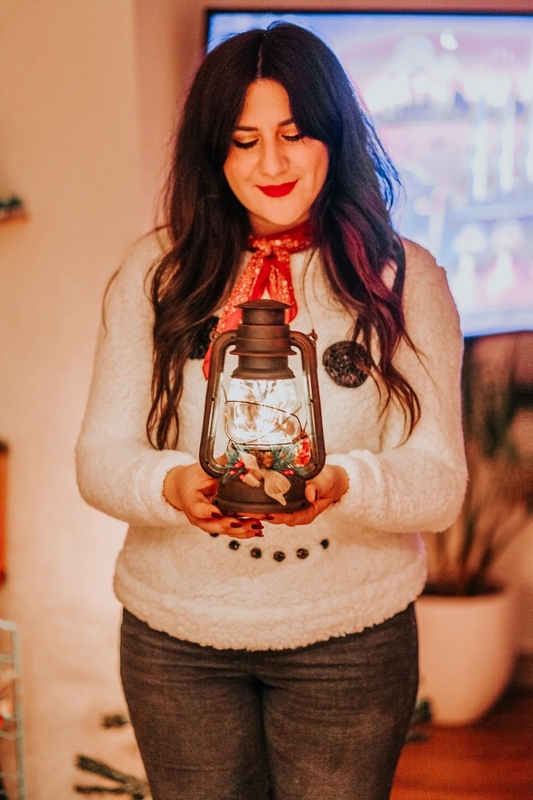 This year I have been especially in the Holiday spirit and decorated my whole apartment with the most adorable pieces from Stage. 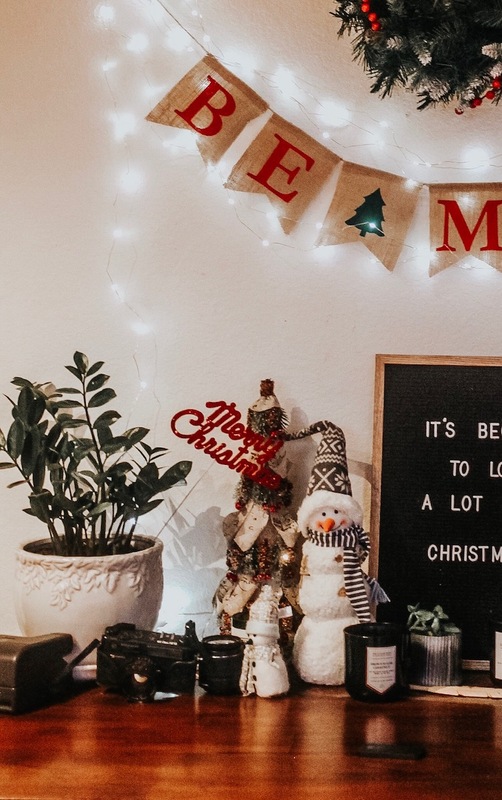 My apartment has limited space, so my favorite way to decorate is by making little holiday vignettes throughout my home, utilizing desks, my bed, coffee tables, etc. I added a touch of my favorite pieces from Stage throughout my home, starting wth my bedroom. This light-up garland was perfect to add to my headboard. it is so easy to put it, and adds a whimsical touch to my bedroom. In my living room above my desk, I hung this frosted berry wreath, which I absolutely adore! I personally love the way a wreath looks indoors(Is that weird?!) And lastly, I was so excited to put up these holiday trinkets throughout my home... the lantern, the snowman, the tree... I'm in heaven! I hope y'all enjoyed a little look into my holiday decorations with Stage stores! I highly recommend browsing their site, they have TONS of other cute holiday decorations and outfits and basically have options for everyone. I know where I will be getting all my holiday shopping done from here on out! 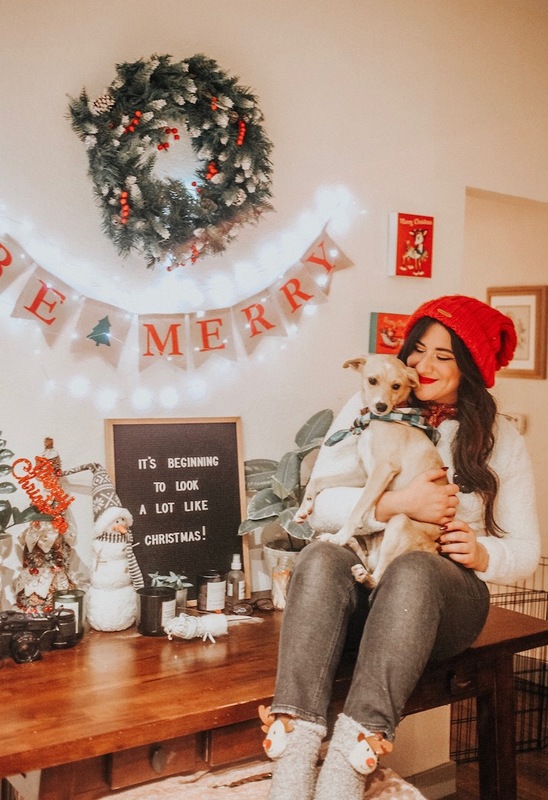 Your Christmas decor is fabulous, I love your Christmassy OOTD, your hair, makeup and lipstick all look beautiful, and that puppy dog looks adorable! 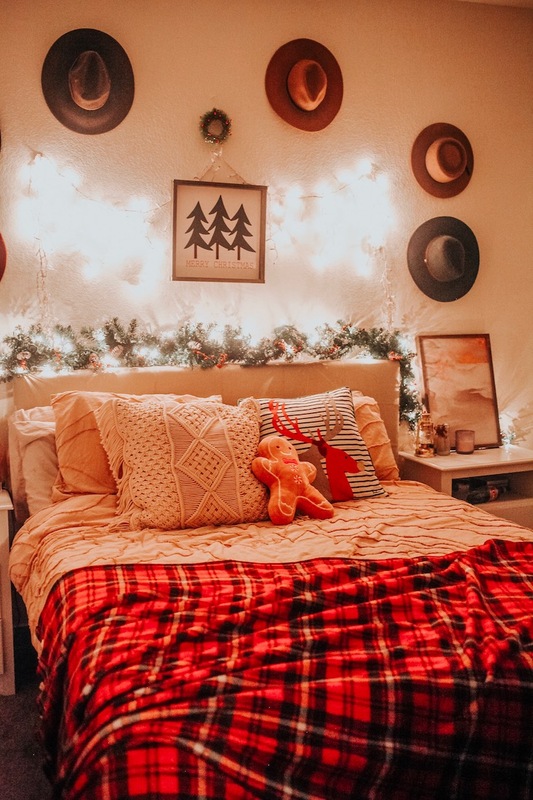 I love that bedroom decor, with the crocheted and reindeer embroidered throw pillows and the stuffed gingerbread person. Thanks for reminding me about hot chocolate - I'll put it on my shopping list! Nice article. and very informative. Ah, wonderful time of the year. Love the decoration, makes me can't wait for Christmas! Hi, This is nice information. I will also share one platform where you will get good information about mens ware . Stunning Christmas decor. Very creative! Strong Christmas breath, across the screen I feel the taste of Christmas, like your bedroom dress, looks very warm, of course, your dress is also very good. So you can take the Escorts In Lahore to bars, to the gatherings, to the clubs, and to wherever that you need.